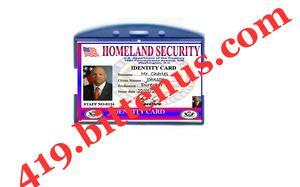 Attention Beneficiary,see the attachment of your box and my working ID. This is to acknowledge the receipt of your affirmation and to inform you of the latest development as regards the delivery of your cargo box by the Diplomat,. While scanning the package our cash track machine detected that the content of the package the Diplomat is delivering to you is cash worth the sum of ($8.5Million USD). It is a crime to bring in money (over US$10,000) into the United States of America without proper documentations and clearance because it shows that the money is either being smuggled into the country or the source of the funds is questionable. It is very important that all the relevant documentations needed to authenticate the source of the funds are provided to prove that the funds were earned legitimately in accordance with the PATRIOTACT so that the FBI, IRS and Homeland Security will not come knocking at your door. In lieu of the above, it is therefore mandatory that you provide the Origin of Funds Certificate (O.O.F) and custom Clarence certificate to prove that the funds have no links with any form of illegality. Being the beneficiary of the package, the Origin of Funds Certificate (O.O.F) and custom Clarence certificate is the only way of confirming the source of the funds and it is your responsibility to provide the Certificate before the delivery will be allowed to complete To You Tomorrow. Upon the receipt of the payment information, the Certificate will be made out in your name by the Benin Republic Authority, scanned and send immediately via email to us so that our agent will be allowed to complete the delivery of your package to you tomorrow. Failure to pay for this documentation is a confirmation that you wanted to smuggle the funds into the country which is a federal offense and a gross violation of the Patriot Act. It is therefore in your best interest that you pay for the Certificate as instructed immediately as the consequences of refusing is very severe.